Auburn University senior Jean Phillippe "Tres" Bodet III was recently awarded a Fulbright Scholarship to Belgium where he will serve as an English teaching assistant. Bodet is pursuing a double major in psychology and communication and a minor in French with the College of Liberal Arts and is a member of the Honors College. A native of Mobile, Alabama, Bodet serves as a research assistant to Jennifer Robinson in the Department of Psychology's Cognitive and Affective Neuroscience Lab. His research examines the neural systems that support bilingualism. "We are delighted that Tres' hard work and dedication to his field has given him this opportunity," said Melissa Baumann, assistant provost and director of the Honors College. "As an international representative of Auburn University, we wish Tres the best of luck in his future endeavors." In addition to his extensive undergraduate research, Bodet has interned and studied abroad in Montreal, Canada, and Aix-en-Provence, France, and has served as a peer tutor in history and French with Auburn's Study Partners program. He is a writing consultant with the Miller Writing Center and works as a manager with the Auburn track and field team. "I am incredibly honored to have been selected for the Fulbright Scholarship to teach English in Belgium," said Bodet. "My gratitude goes to Auburn for providing me with the best mentors in Dr. James Truman at the Writing Center, Dr. Jen Robinson with the psychology department, and Dr. Adrienne Angelo with the French department. Their tutelage has helped me improve me as a student and an instructor, skills which will serve me well while in Belgium." 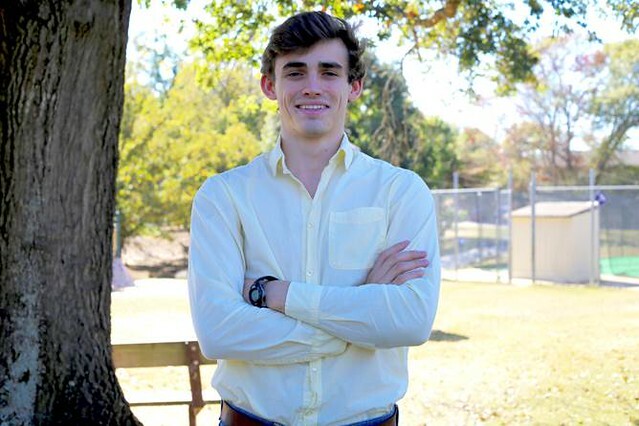 Auburn University senior Jean Phillippe “Tres” Bodet III was recently awarded a Fulbright Scholarship to Belgium where he will serve as an English teaching assistant.